About a month ago I met up with the Time Out New York team to shoot a spring look that I styled with pieces from some of my favorite Brooklyn stores. The feature that included a few other Brooklyn-based bloggers was in an issue on newsstands, but it can also be check out online HERE. I am absolutely obsessed with everything mint right now! Even though we completely skipped spring here in Kentucky, I'm going to rock spring colors anyway! Hope you had a fantastic weekend girl! Congrats on the feature! 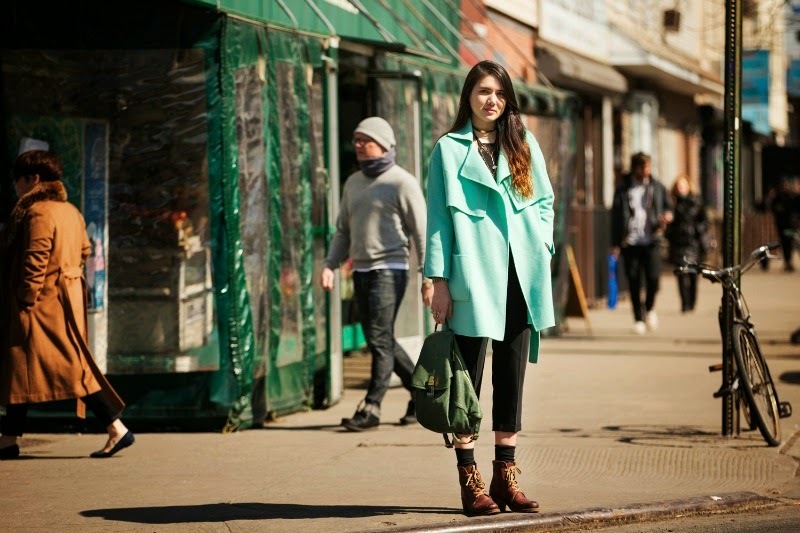 Love your mint coat! I love this outfit! That jacket is beautiful! Congrats Dylana! This look is awesome by the way. The colors. Oh don't get me started. The orange, the turquoise, the browns, greens, uh. I love it! this coat is such a stunner!!! Congrats on the feature; you look awesome. love the color of your jacket, so perfect for spring! that jacket is gorgeous!! totally love it! !